How to construct an up-to-date and annotation-rich RangeSummarizedExperiment object around old microarray data? Question: How to construct an up-to-date and annotation-rich RangeSummarizedExperiment object around old microarray data? I would like to construct a RangedSummarizedExperiment from an ExpressionSet (eSet) object (microarray data). What I would like to do is to construct a RangedSummarizedExperiment object from the eSet. 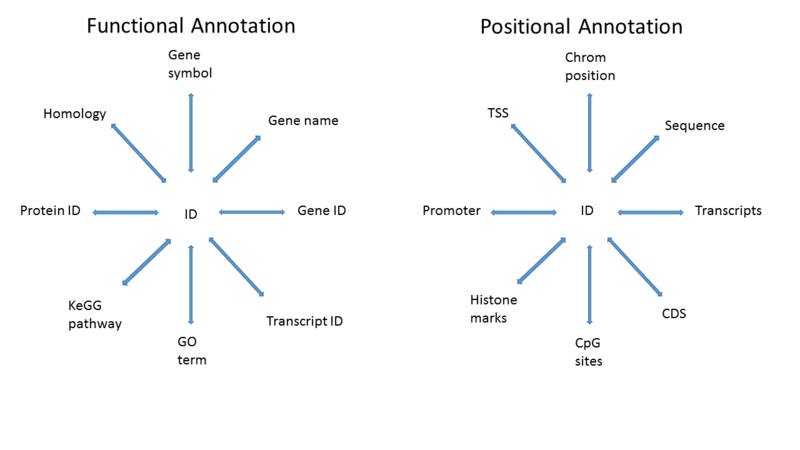 My goal is to have functional annotation (Gene Symbol, GO term, etc..) but also positional annotation (James W. MacDonald | BiocAnno2016) so that I can do range-based queries. My question is then how to proceed in order to construct an up-to-date and annotation-rich object around this microarray data? My tentative approach is to take the genbank accession associated with each probe id (info returned by getGEO("GPL180")) and get the respective sequences. Then, somehow, map them to the most recent version of the human genome and work out the rest of the annotation from the found genome locations? Is this how you would approach this problem? Unfortunately, there is not a single, simple approach here and the outline I give is without any testing. That said, you could use the UNIGENE ids to map back to ENTREZGENE id's using the org.hs.eg.db package. From the ENTREZ IDs, you can map to transcripts via the appropriate transcriptdb object. There are going to be a lot of unmatched IDs, I suspect, but the approach I sketched out will eliminate any mapping steps and utilizes only Bioconductor annotation resources. As an aside, note that fData(perou2000_gse[]) will get you the GPL annotations. Thank you for your answer Sean. 1. Fetch the EST sequences corresponding to the microarray probe IDs using genbankr pkg? 2. Use gmapR pkg and the human genome BSgenome.Hsapiens.NCBI.GRCh38 to map the sequences. 3. Convert the `GAlignments` objects obtained from `gmapR` to `GRanges` objects and use them to construct the `RangedSummarizedExperiment` object..? I'd say give it a try.